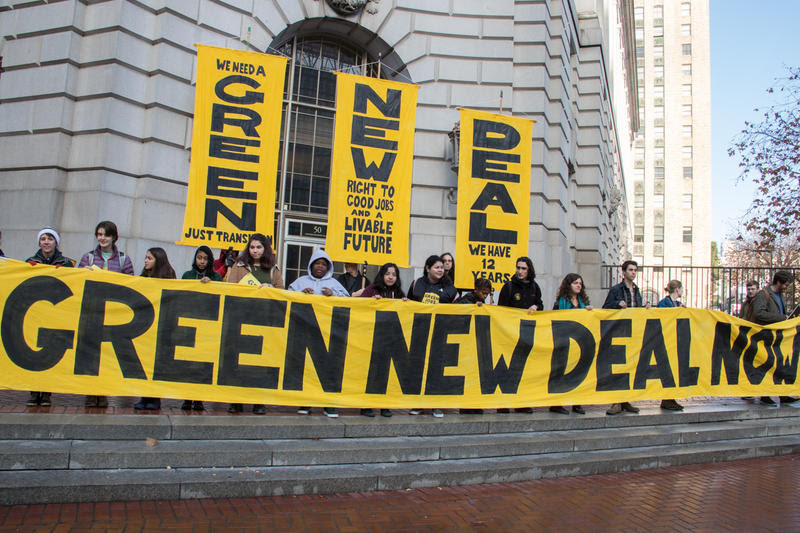 If you liked FDR’s New Deal — which imposed federal regulations, restrictions and spending in virtually every aspect of American endeavor — you’ll love the Democrats’ Green New Deal. Some elements of the vague and nebulous proposition were finally revealed in a draft resolution this past week. All except the price tag. The “green” part of the proposal is audacious, to say the least: To replace all existing power sources in the country with 100 percent renewable power in the next 10 years, thus eliminating all greenhouse gas emissions in the country. Oh, but not just this country. The resolutions calls for “funding massive investment in the draw-down of greenhouse gases; making ‘green’ technology, industry, expertise, products and services a major export of the United States, with the aim of becoming the undisputed international leader in helping other countries transition to completely greenhouse gas neutral economies and bringing about a global Green New Deal.” Pie in the sky. How much “green” will that cost? California’s Energy Commission recently mandated such efficiency measures for every new home being built in the state starting next year. The commission estimated the cost to be $9,500 per home. Since there are more than 130 million residential housing units in the U.S., that alone would cost more than $1.2 trillion. There are at least 5.6 million commercial buildings in the country, most much larger than residences and therefore more expensive to remodel to “state-of-the-art energy efficiency” levels, much less comfort and safety. But the Green New Deal does much, much more than clear the air. It also would “include additional measures such as basic income programs, universal health care programs and any others as the select committee may deem appropriate to promote economic security, labor market flexibility and entrepreneurism …” Medicare for All, being pushed by socialist Bernie Sanders and others on the left, is estimated to cost $32 trillion over the next 10 years. Who knows what a “basic income program” would cost. How to pay for it all? you ask. In the frequently asked questions section of the resolution there is a solution: Print money. Actually it says, “The answer is: in the same ways that we paid for the 2008 bank bailout and extended quantitative easing programs, the same ways we paid for World War II and many other wars. The Federal Reserve can extend credit to power these projects and investments, new public banks can be created (as in WWII) to extend credit and a combination of various taxation tools (including taxes on carbon and other emissions and progressive wealth taxes) can be employed.” Read: Print money. Recently on “60 Minutes” one of the chief proponents of the Green New Deal floated the idea of imposing a 70 percent income tax on the “wealthy.” Unrepentant socialist and New York Democratic Rep. Alexandria Ocasio-Cortez said that, as in the 1960s, tax rates for those with incomes up to $75,000 could be as low as 10 or 15 percent, but much higher for those earning millions. “But once you get to the tippie tops, on your ten millionth, sometimes you see tax rates as high as 60 percent or 70 percent,” she added. She fails to realize that there were enough deductions and loopholes that no one ever actually paid a 70 percent income tax rate. It just comes so easy when you assign an army of federal bureaucrats to fix the problem. You know, the ones who run the Veterans Administration, the Post Office, the Internal Revenue Service, Immigration and Customs Enforcement, the Environmental Protection Agency, the Bureau of Land Management, the National Endowment for the Arts, Congress, etc., etc. This poppycock reportedly is backed by 40 duly elected House Democrats.